Thinking again to resubmit this review. The environment and environmentalists now under attack from people either very ignorant or simply downright ... well, fill in the blank yourself. ... this book is about ideas, and the power of those ideas to influence public opinion. from the author's prefaceJ. Edward de Steiguer is a writer and professor at the University of Arizona. He specializes in the federal lands of the American West.Major portions of Origins were published under a different title a few years earlier - The Age of Environmentalism. That earlier book "has received a complete reexamination and rewrite", and three new chapters were added (see below).This is an excellent overview and introduction to the environmental movement. It should have far more than four ratings here on G.R. I've never read and rated any other book here which I feel is as under-read as this one.In the first chapter (Foundations of Environmental Thought) Steiguer reviews the ideas of many of the pre-mid 20th century thinkers whose writings connect to modern environmentalism, such as Malthus, John Stuart Mill, Thoreau, John Muir, and Aldo Leopold. The second chapter (Post-WWII Socioeconomic Conditions) describes the American scene prior to the publication in 1962 of Rachel Carson's Silent Spring, initially serialized in The New Yorker. 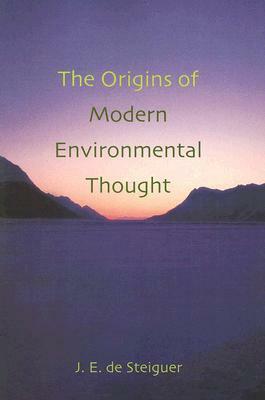 This is the event which Steigeur identifies as the explosive beginning of the modern environmental movement.The next 14 chapters each examine a specific writer (in chronological order, starting with Harold Barnett & Chandler Morse, and ending with Arne Naess), with biographical data, an overview of the author's environmental writings, how they influenced subsequent environmental thinking, and a summary and evaluation of criticisms. Most chapters conclude with additional biographical data on the author, in the period following their main environmental writings.The first writer examined is of course Rachel Carson. Other writers and topics include Paul Ehrlich, Garrett Hardin's "The Tragedy of the Commons", Barry Commoner, The Limits to Growth, and the Deep Ecology movement. There are several chapters on writers I was not familiar with, such as Roderick Nash, Kenneth Boulding and Lynn White.The new chapters which de Steiguer added in his rewrite are: 5. Stewart Udall and The Quiet Crisis; 6. Roderick Nash's Wilderness and the American Mind; and 15. E.F. Schumacher's Small Is Beautiful.The final chapter is Beyond the Age of the Environmental Philosophers, a title which connects the book in my mind to Robert Heilbroner's The Worldly Philosophers. It may be a bit of a stretch to say that Steiguer has done for the history of environmental thought what Heilbroner did for the history of economic thought - but not too much of a stretch.Anyone interested in the history of environmental thought would, I think, find this a very satisfying book.